According to Zoopla, throughout our lifetimes, most of us will move house around eight times, but it can still be something of a stressful experience, which is why the help of an estate agent is so invaluable. This is especially true when selling a park home, as these properties require specialist knowledge that a specialist can provide can provide. However, you’ll quickly find that not all agents work the same, or provide the same level of service, so we’ve put together this guide of ten top tips to help make sure that you get the best possible price for your park home. 1. Where Will They Advertise? Firstly, try and find out what kind of places the agent will be advertising your property at. Will they be making use of traditional methods such as in newspapers or using more modern platforms such as online property websites? For example, here at Sell My Park Home we will advertise your property not only on our own website but also on Rightmove and Preloved to ensure that your park home gets in front of as many eyes as possible. The more platforms that your property is advertised on, the more chance it has of selling, so it’s of the utmost important that you check this. You should always make sure to do your research and make sure that the estate agent that you’re going with is experienced, and has a track record of successful sales. This means heading to their website and seeing what you can find out about the company history, the experience of their staff and also to see if there are any comments or reviews from other customers which will give some indication to the level of service provided. A look at the website can also give a good idea of the quality of photos that the agent provides. Ask yourself if you would consider buying a property from their site too. This is especially important when it comes to park homes. If you go with an otherwise experienced agent who has actually never dealt with park homes, you could find that they struggle to find you a buyer and don’t really know where or how to market the property without that insider knowledge of the industry. Going with a specialist park home agent also means that they should hopefully already have a decent pool of potential buyers lined up. If you ask a couple of different agents to give you a valuation and find that they’re all in a similar area, then you can generally assume that they’re all quite accurate. However, you may find that one agent comes in with a significantly higher or lower figure. If this is the case, then they might be attempting to offer you an overly-optimistic estimate to sway you to choose them. Make sure that you ask an agent to back up their valuation and show you examples of similar properties which have sold for a similar price. Estate agents will go on and on about why they’re the best people to sell your property, but one of the best possible signs of their quality comes through whether they have any industry accreditations. For example, are they a member of the NAEA (National Association of Estate Agents) By signing up the NAEA, the estate agents have shown that they agree to comply with a national code of conduct to ensure that they provide the very best service possible. Also look out for the RICS, another body which accredits professionals within the property sector and aims to protect consumers through a strict code of ethics. Making sure you opt for an accredited agent means that you know that you’ll be getting the ultimate peace of mind. Of course, informal recommendations from friends and neighbours who have dealt with an agent before can be just as valuable. 5. Do They Have Any Links With Park Home Manufacturers And Parks? 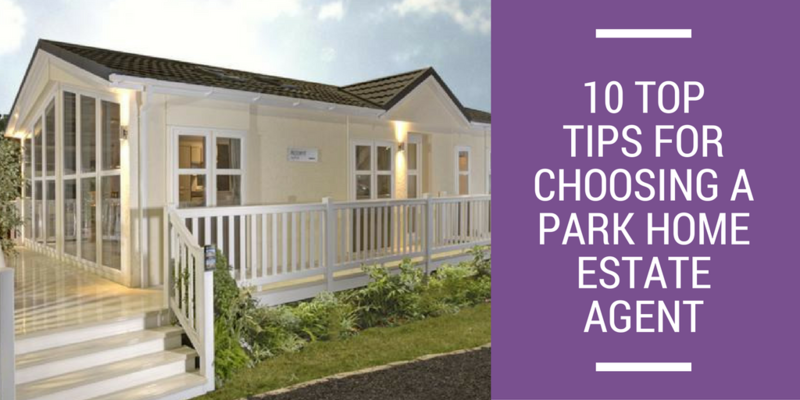 In the case of park homes, it’s also handy to see if your agent has any partnerships with any park home manufacturers or the parks themselves to help make the sale as smooth as possible. Selling a park home isn’t like selling a traditional home, and seeing that your estate agent is recommended by those within the industry is a real seal of approval that shows that they know what they’re doing and will be able to find you a buyer. As important as everything else is, one the first things that people always want to know is how much are things going to cost them. Your estate agent’s fee will usually be a percentage of the final selling price of the property, but there could also be other costs added on for services such as advertising and photographing the property. Some agents will also charge a fee if you choose to withdraw the property from the market further down the line. Make sure that all of this is discussed and agreed upon up front so that you don’t get caught out by any nasty surprises. At the end of the day you’ll need to make your own judgement on whether you’re getting value for your money, but make sure you don’t always assume that the cheapest option will be the best one, as this is very rarely the case. 7. The Traditional Route Or Online? Nowadays one of the major decisions you’ll have to make when deciding on an estate agent is whether you want to sell your property through traditional means, or online. While either way can work, the fact is that 95% of all purchasers start their search online. The convenience and availability that the internet offers means that your property is available to view 24/7, with potential buyers able to book a viewing one night while sat in front of the TV rather than having to wait until the estate agent on the high street is open. However, online agencies usually don’t have offices, and while some people complain that they would rather deal with a ‘real person’, the truth is that there’s always a real person waiting at the end of the phone to help you out however they can. At the end of the day, you’re trusting your estate agent with one of the most expensive assets in your life, it’s a big deal! For this reason, we can’t recommend enough that you spend time having a chat with the agent to get a sense of what they’re like and what kind of service they’re going to give. Whether it’s in person or over the phone, does your estate agent make you feel welcomed and valued? Do they go out of their way to make sure that they’re helping you however they can? If there’s a general atmosphere or friendliness and professionalism, you’re probably onto a winner, and if not, you should probably look elsewhere. For example, to some, an agent turning up late for a meeting might seem like a minor annoyance, but what does it say about their professionalism and the service that they’re going to give you? If there’s one thing which we can’t recommend enough, it’s asking lots and lots of questions. After all, they’re working for you, so you want to make sure that they’re doing what you’re paying them for. It’s important that you are kept informed right throughout the sales process, so don’t feel like you’re being a pest if you keep badgering your agent, it’s what they’re there for. You’ll quickly be able to tell whether your estate agent actually knows the market once you start firing a few questions at them, so it’s a good way to see if they can back up their claims! For a bit of a hand on what sort of things you should be asking of your estate agent, check out this handy checklist from Which?. While a good agent will usually have a good idea of your circumstances and needs, especially if they’re a specialist park home agent, it’s still important to outline exactly what your needs are. For example, perhaps you need to sell up by a certain date. If this is the case, it’s important that you let your agent know this as soon as possible! Give them as much information as possible to really help them to help you, and be honest about why you’re selling. A good agent will be able to take all of your expectations and circumstances and tailor the service they give you to suit them.